A sci-fi/action RPG from acclaimed developer Gearbox, Borderlands combines the best in first-person shooter (FPS) action gaming with elements of a traditional role-playing game (RPG). The excitement of this hybridization is further magnified by the game's groundbreaking content generation system which allows for a near-endless variety in missions, environments, enemies, weapons, item drops and character customization, making the game's single player, multiplayer and online campaigns not to be missed. 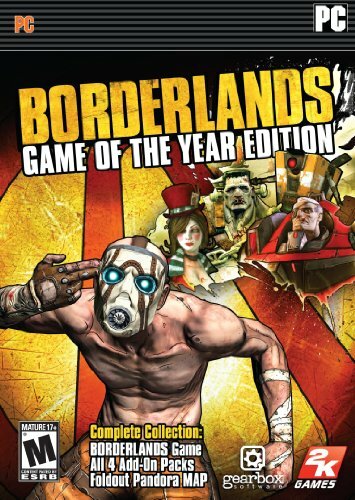 This special Game of the Year edition takes the action even further with the inclusion of all four of the downloadable content releases for the game, as well as a fold-out map of all the Borderlands Pandoran territories. "Product only available for US distribution. Quantity limits may apply."